A fantastic trip, Had a great time! 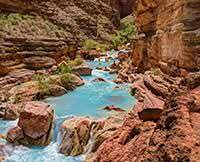 14 of us just got back from our the 3 day trip river rafting the Grand Canyon (Our Bucket List). I can't begin to tell you how impressed we were with you entire organization. Everyone from the people at Vision Airlines to James our bus driver. When we landed at The Bar 10 Ranch , there was a delay in getting us down to the river, the people there kept us informed, fed us, and even offered to take people horseback riding. The helicopter ride was awesome, especially when you go over the canyon wall. Our guides were 4 of the nicest, friendliest, professional guys you will ever meet. Evan, Matt, Johnny and Scott were outstanding, knowledgable and every detail or sanario was taken care of. Even cooking a great dinner in heavy rain ,thunder and lightning without gettting anything wet. Your company should be proud to have these guys work for you. "Give them a raise". I would highly recommend your company to anyone thinking of doing this trip. There was nothing like sleeping under the stars watching shooting stars from the bottom of the canyon. The food was great, plenty of it. These guys are magicians with a dutch oven. Shrimp cocktail at rivers edge at the bottom of the Grand Canyon... Who Knew!!. Again, Thanks to Evan, Matt, Johnny and Scott from the Boys from Boston (really Norwood).